1) As we discussed previously, the Volume of Fluid (VOF) approach allows you to solve free surface problems and maintain a sharp interface. However, what happens if additionally there are some regions of the flowfield where droplets are present, as would happen in an oil water separator? 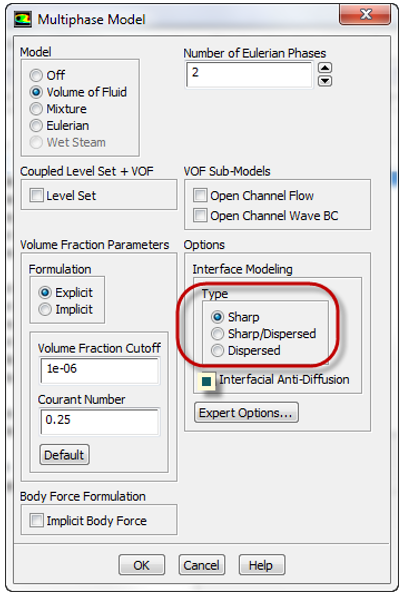 In ANSYS 16, you can now choose whether you want a sharp interface, sharp in some regions and some disperse flow or all disperse flow. The code then sets up all the numerical schemes automatically for you. Refactored GUI panel showing the options for the type of interfaces to be captured (in red box). The Green button enables the anti-diffusion model. 2) When you do have a sharp free surface interface, you want it to be captured sharply even on a relatively coarse mesh. This can now be achieved by enabling an anti-diffusion scheme that adds just enough negative diffusion to sharpen up the interface without causing numerical problems. It is helping produce much better free surface flows and has been demonstrated by us to massively reduce the artificial ventilation that occurs under ship hulls at high Froude numbers, as shown in the pictures below. Water volume fraction on the wetted surface of a hull for a Froude number of 1.55 showing the elimination of the artificial air entrainment when the anti-diffusion term is activated. 3) In the previous blog series, we talked about knowing the morphology or flow regime before suitable models can be chosen. 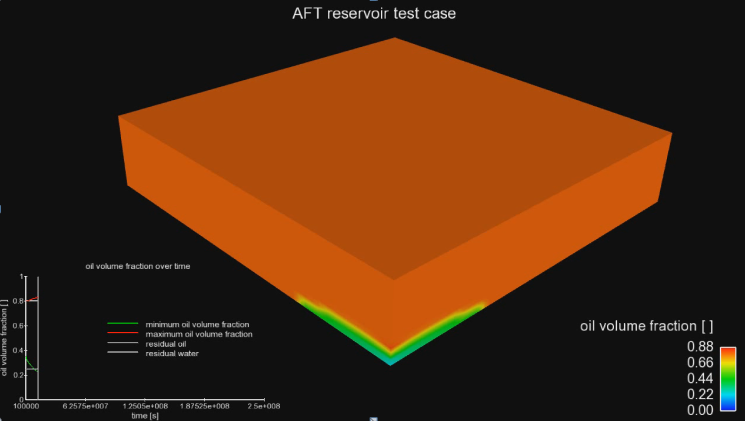 This has been a requirement in multiphase modelling until recently, making it hard to model the transition from say slug flow to annular flow in a two-phase oil-water mixture. This is because interfacial area and interphase drag need to be calculated differently in the different flow regimes. Experienced users have been able to work around this by implementing their own models, but the process has a steep learning curve. Starting at 16 and continuing in 17, this is being done automatically for the user making the process simpler and much less time consuming to setup. We encourage you to attend the 11th International Conference on CFD in the Minerals and Process Industries organised by CSIRO on 7-9 December, 2015 and listen to the keynote presentation by Dr. Mohan Srinivasa of ANSYS to learn more about these exciting developments. A mixture of gas and liquid enters at the left hand boundary and as it flows along the pipe the regime changes from bubbly to slug flow, with this transition being captured automatically. 4) We discussed previously that many multiphase flows are inherently unsteady in nature. Take the example of a bubble column, in which gas is bubbled through a liquid to cause mixing and high mass transfer rates from the gas to the liquid. At any instant, the flow appears completely random but time-averaged experimental data will show a well-defined flow pattern. To understand this system using CFD, transient runs must be made that are long enough to capture this pattern. The simulation times are potentially huge but the recent introduction of a Non-Iterative (NITA) multiphase solver at V16 is reducing these times by more than an order of magnitude. Prof. David Fletcher (University of Sydney and LEAP Australia) will present a detailed case study at the same conference, so we encourage you to come along and learn how this can save you significant computational time for these classes of problems. 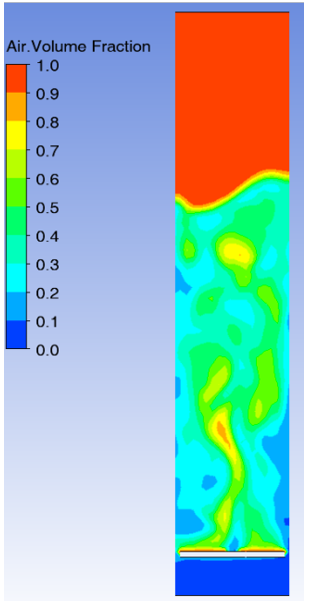 Air volume fraction plot showing the complicated pattern of bubbly flow in the column and the sharp free surface as the bubbles disengage and exit the vessel. 5) ANSYS has always prided itself in its multiphase physics capabilities and seeks to extend these where needed. Multiphase flow through a porous medium is such an example, where macroscopic equations govern the flow yet microscopic behaviour determines the details of the drag and phase holdup. At ANSYS 16, new models have been introduced to provide well-established constitutive laws for relative permeability and capillary pressure, making the solution of such problems possible. A typical application is simulating the flow through a drill hole taking into account the local flow in the surrounding rock. Plots showing the oil and water volume fractions in the vicinity of a well bore at a given instance in a transient simulation.